In honor of the SciFi comedy FUTURE ’38, which screens Wednesday, May 17 at Flix Brewhouse, the OWA staff is creating a Time Capsule to be opened in 80 years. FUTURE ’38 is a Technicolor valentine to the classic screwball comedies of the 1930s and ‘40s, with a SciFi twist. It’s a time-travel adventure which presents the exotic future-world of 2018 A.D., as imagined by the filmmakers of 1938! The OWA Time Capsule is designed to represent the most significant artifacts from our era and to explain to the people of 2097 what we were all about and, frankly, what was wrong with us. Young or old, no matter what your upbringing I'm sure that you'll have fond -- and not so fond -- memories of childhood toys. Then again, if you are like me you may still collect toys, although I'm cool if you want to call your Hans Solo an "action figure." My beloved toys included Leo the Lion, who I would take to show and tell and I kept long after his pull string broke. He could no longer roar or state his name, but he was my connection to home when I was away at college my freshman year. On the "not so fond" reference, the Fisher-Price Chatter Phone strikes fear in my middle sister. Someone (who *might* or might not have been me) tossed the phone off the top bunk, striking and lacerating her forehead. We like to joke about the incident now, but she won't hesitate to pronounce the phone as being a weapon of sister destruction. I find it intriguing that this classic roll-along pull toy is still available for purchase, in a day and age when rotary dial phones are no longer a mainstay as a "landline" in our homes as they were over 50 years ago. With that, I've liked to contribute my observations on the toys available in our modern age, and suggest their placement in our special time capsule to be opened in the distant future. That is, longer after I've moved onto my next plane of existence and can't be held accountable for the existence of these toys. As a Baby Boomer kid from a lower middle class family, I envied my friends who had the wind-up Hot Potato game. Tension would build as players passed the potato, waiting for the buzzer to go off when the time ran out. My sisters and I were limited to borrowing an Idaho spud from the potato bag to play the game, with one of us randomly shouting "BUZZZZZ." We had quite the imagination. Now in 2017 Hasbro Gaming offers a game that not only randomizes when you "lose", but also kids can learn letters and numbers with Toilet Trouble. "Which flush will cause the gush?" the game packaging boasts, and players can press the handle for authentic flushing sounds. Somewhere there's a prankster who has probably incorporated the use of Tootsie Rolls to emulate the true experience of toilet trouble. Plunger, anyone? Who needs Beanie Babies with a delightfully grumpy plush resembling the real live Grumpy Cat? Those are so 1990s, and no animal in history has been the subject of countless memes like Grumpy Cat. Thousands of people line up at events throughout the year for the pleasure of taking a photo with this famous feline. I'd rather have the plush toy to remind me that it's not cat-astrophic to be grumpy on a routine basis. 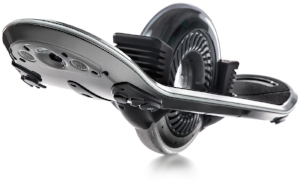 Toss out your skateboard, and longboards are so last decade -- the hoverboard is where it's at! While the heathens are riding lower cost boards, the official Hoverboard is where it's out. $3995 will get you a Full Hoverboard with LED lights, bluetooth music, speed of 16 MPH, and ground-sensing sonar keeps the board parallel to the ground. Slow down there, Speedy Gonzales! Marty McFly knew where it was at with this levitating personal transportation fictionalized for 2015 in BACK TO THE FUTURE 2, but it's really only been this year that technology has offered an autonomously powered personal levitator. Despite its current price range, something tells me that we'll see more and more hoverboards in the general populace -- the turbojet powered Flyboard Air jetpack/hoverboard is well out of most schoolkids allowances. The attention span of both children and adults alike has decreased exponentially, thanks to social media platforms such as Twitter and Snapchat. Invented in the 1990s to relief stress, this soothing toy was meant to release pent-up energy and "promote peace" according to alleged creator Catherine Hettinger. This toy became popular with adults as a "must-have" office and desk toy, but some school districts have elected to ban the toy. Teachers claim that the spinners are distracting students from their work, while teachers who work with individuals with ADHD and autism proclaim spinners as useful for kids who have difficulty focusing in school. I apparently am not as dexterous as schoolkids, as I find that I have to focus to operate my spinner. Who knew that a pile of poo resembling a soft-serve ice cream could achieve such notoriety? "Pile of Poo" was approved as part of Unicode 6.0 in 2010 and added to Emoji 1.0 in 2015, but it wasn't until last year that kids of all ages embraced this emoji. One three-year-old even asked for a poop-themed party, wearing a poop costume and playing "pin the poop," poop emoji-shaped pinata -- filled with Tootsie Rolls and Hershey's Kisses naturally. I'd like to be there when this young girl is say, 16 or 30, and her mom says in front of a suitor, "remember that time you had a poop-themed party? Let's show Bruce those photos!" That's more than a little cringeworthy.